It’s been a big week here at Ethos and VONT. 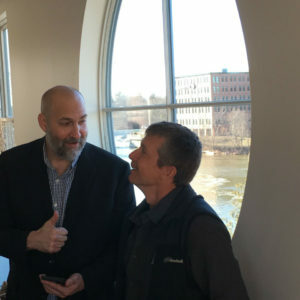 Last Friday, we packed up our existing offices and moved a few blocks down the street to a newly constructed state-of-the-art building located at 17 Ash Street – right on the riverfront here in Westbrook. This move has been in the works for more than a year, and the lead up required considerable planning. Early on, we entertained renovating our existing space – an historic building off Main Street in Westbrook that once served as an old foundry. 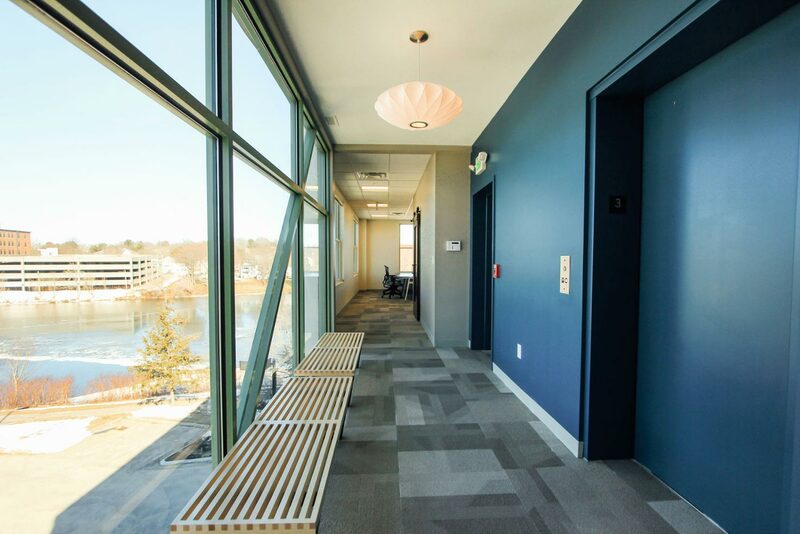 But when we discovered 17 Ash Street, a new building right on the riverfront and just a few blocks away, we knew it was the right space for us. Being able to create a new space – one that fit our agency culture of collaboration, integration and creative idea generation – was an opportunity we just didn’t want to let pass. 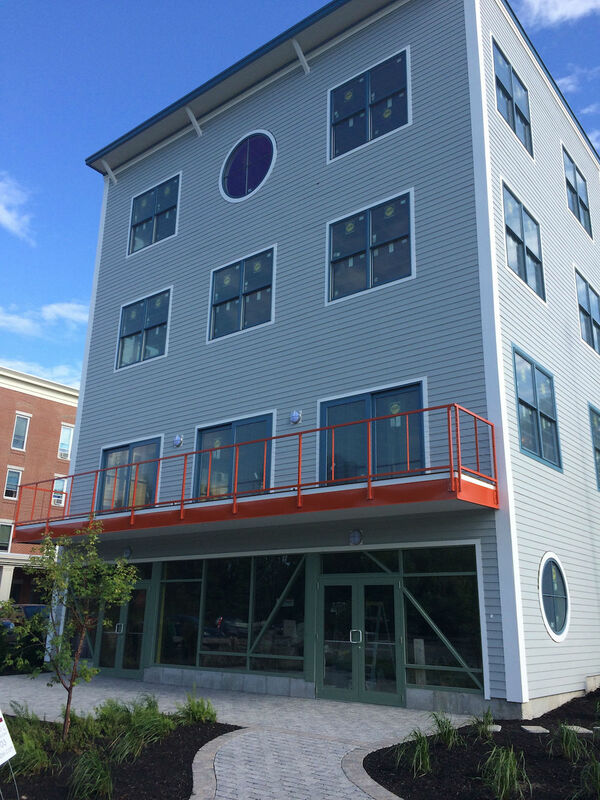 The picture above shows our new digs from the outside (Photo Credit: Lauren Sawyer Photography, Westbrook, Maine). Moving a company with about 50 employees is no simple task, but we really needed more space to keep pace with our steady growth as a company. As we considered creating the internal space, we knew that engaging all the people who work here in the process would be crucial to its success. We found two great partners to help us turn this wonderful space into something really special – Falmouth-based architecture and commercial interior design firm TLA, and Portland-based furniture dealership, Red Thread. Through an employee survey and several workshops, Red Thread pinpointed what would suit our culture and the employees best, and then TLA helped us realize the vision. Here’s what we learned: our employees (across all generations and experience levels) wanted more informal space to gather and connect, and they wanted different types of environments to work in versus being tied to a single desk. Our employees also wanted more opportunities to augment the sharing of experience and knowledge in the workplace between our two companies. 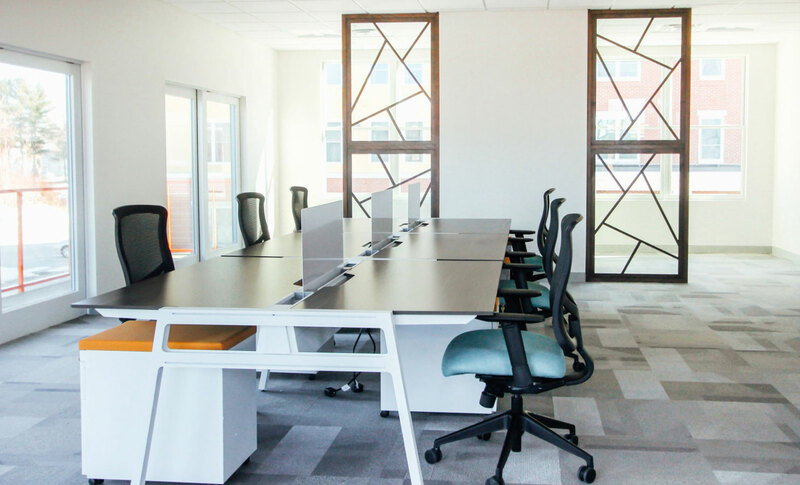 When you walk into our offices, the rooms are open and filled with lots of natural daylight and plenty of public spaces to encourage collaboration and idea exchange. The Plaza – a beautiful lounge/kitchen where employees can casually interact at the oversized island as well as meet at long harvest tables paired with modern classic chairs. 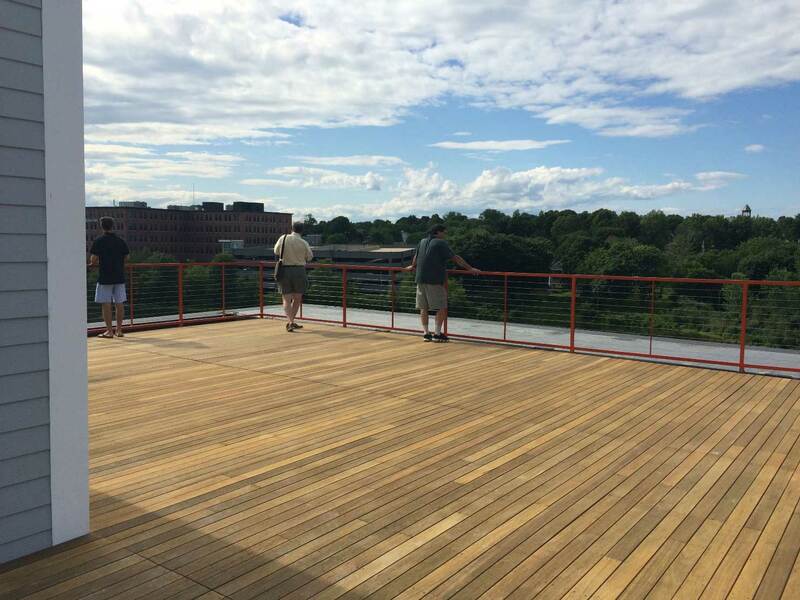 A rooftop deck overlooking the Presumpscot River that employees plan to enjoy in the warmer months. Lots of windows that frame views of the River and historic Westbrook from every floor. Conventional offices with doors do not exist, even for the partners. In fact, the only rooms with doors are the eight conference rooms featuring walnut stained glass sliding barn doors – and the four bathrooms. Three of the smaller conference rooms called phone booths are where employees can make private calls or just get away – balancing “me” and “we” spaces. One of the phone booths will serve as a lactation room for new mothers. TLA was inspired by the architecture of the building with its angled glass façade and steel entrance on the front of the building. This “fractal” inspiration is present in the carpet and fabric selections as well as in the walnut stained dividers, which define spaces, but still evoke transparency between open office benching systems and other spaces. Specialty lighting weaves modern with a mix of industrial chic. 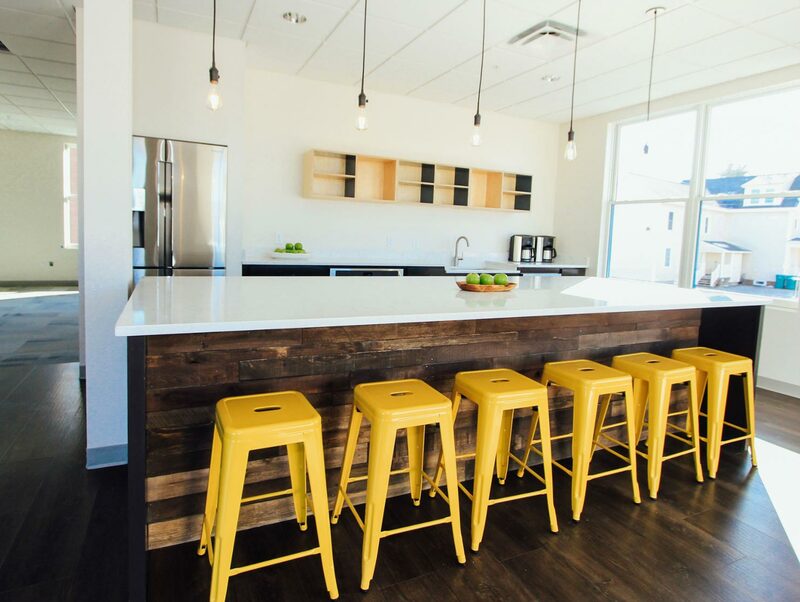 Select walls throughout the space prominently feature warm wood from old shipping palettes that employees jointly deconstructed and stained adding their own personal touch to the space. We’re excited to start this next chapter for our company. It’s wonderful to see our employees so jazzed and excited to be at work, and rewarding to know that we created this workspace together. Interested in seeing our new digs in person? Stop in and say hello!